‘How can I use TIP Model to plan ICT-enriched lessons during professional experience?’ ‘How can I involve integrating technology in teaching Prep?’ Going through the five phases of TIP Model before and after teaching a Mathematics lesson, I gained a better understanding of how to use ICT in teaching effectively. What advantage does ICT give? : Using ICT to teach the chosen content descriptors to engage students in the lesson. Students gave their attention to the lesson content when I used an educational video clip to introduce ‘addition’ to them. Design ICT integration strategies: I also used an online test to transform students’ learning. Students would watch the questions on the screen then write their correct answer on a white board. The number of correct answers would reflect students’ understanding relating to the lesson taught. Organize learning environment to enable strategies to work: I used an interactive white board connected to a laptop to deliver the ICT-enriched lesson. The content of YouTube educational video clips used to expand students’ understanding of addition was checked by mentor teacher before using. Reflection: What worked well and what needed to improve? Writing a reflection after teaching the lesson, and receiving feedback from mentor teacher, I realized that I need to focus on behaviour management and the lesson’s duration. (Some students behaved inappropriately during the lesson such as talking, and imitating the way I spoke. The lesson lasted for 1 hour instead of 30 minutes). This last stage helped me as a preservice teacher to learn from the mistakes made to improve for the next lesson. Technology Integration Planning (TIP) Model (Roblyer, 2003). Roblyer, M.D. (2006). Integrating educational technology into teaching. Pearson Merrill Prentice Hall, Upper Saddle River, NJ. The table showing the differences between using technology and technology integration (Rao, 2013) in the week 6 lecture helped me to track my unit of work’s ICTs- enriched learning activities. I looked through all the learning experiences planned and asked myself questions ‘what are the goals of technology integration?’ ‘who will use technology?’ ‘how can I make changes to focus on technology integration rather than using technology for the sake of using technology?’ My purposeful goals of technology integration are to support curricular goals and learning objectives, to engage students with content, to create and develop new thinking processes and to encourage higher-order thinking skills (Rao, 2013). I realized that I used technology in constructing knowledge rather than providing opportunities for students to use ICT to transform their learning. I made some changes in the unit plan in which ICT was used to transform the learning and focused on technology mostly being used by the students (Rao, 2013). I also focused on using decoding learning themes that support students learn with others through their discussion, learn through practice and learn from their assessment (Farwell, 2017). Farwell, V. (2017). EDC3100: Week 6 – Enhancing your ICT enriched learning experiences. University of Southern Queensland. Retrieved from https://usqstudydesk.usq.edu.au/m2/mod/book/view.php?id=759249. Rao, A. (2013). What’s the Difference Between “Using Technology” and “Technology Integration”?. Retrieved from https://teachbytes.com/2013/03/29/whats-the-difference-between-using-technology-and-technology-integration/. This week I learnt how to use the backward design model and apply Bloom’s Digital Taxonomy (Churches, n.d) to sequence the learning experiences. I used Bloom’s Digital Taxonomy and selected different tools from the ICTs to ‘underpin the pedagogical focus’ (Dann, 2017) that would support students to learn effectively. I constructed students’ knowledge of the unit, I asked students different questions relating to the lesson topic, then led a whole class discussion using a PowerPoint presentation to provide further information. I also checked students’ understanding by engaging them in the formative assessment. In learning experience 2, students were asked to work in groups and share their ideas, then organize the information as requested and use ICT to present the information. By doing this, I focused on ‘Applying’ and ‘Analysing’ Bloom’s Digital Taxonomy. I applied ‘Evaluating’ and ‘Creating’ terms of the digital Taxonomy in learning experience 3 when I asked students to collaborate by working in groups and use ICT to represent the knowledge and information gained from the unit plan. Churches, A. (n.d). Bloom Digital Taxonomy. Retrieved from http://digitallearningworld.com/blooms-digital-taxonomy. Dann, C. (2017). EDC3100: Week 5 PowerPoint presentation. University of Southern Queensland. Retrieved from https://usqstudydesk.usq.edu.au/m2/course/view.php?id=10924. After receiving feedback of assignment 1, I realized I needed to focus on teaching content descriptors rather than teaching ICTs. I understand there are two perspectives – learning from ICTs and learning with ICTs – that are related to developing the learning experiences. The unit plan should provide students with the opportunities to learn with ICT to amplify their learning and transform the knowledge and information learnt. In assignment 1, I focused on teaching students to use a PowerPoint presentation rather than teaching them how to ‘describe strategies to make the classroom and playground healthy’ (ACARA, 2017). I was also confused when placing and explaining the chosen content descriptors into ‘constructing knowledge’ and ‘’transforming knowledge’. Information gained from week three lecture, which provides further explanation for constructing and transforming knowledge and using Bloom’s Hierarchy, helped me rearrange the content descriptors and organize learning experiences for stage 2 of assignment 2. Australian Curriculum, Assessment and Reporting Authority [ACARA]. (2017). Australian Curriculum: Health and Physical Education Year 4 Level Description. Canberra: Australian Curriculum Assessment and Reporting Authority. Retrieved from https://www.australiancurriculum.edu.au/f-10-curriculum/health-and-physical-education/? Choice Awareness blog (2001). Image 1- Choice Awareness. Retrieved from http://www.choiceawareness.com/cms2/view.htm/2/48/1349/2132/Services+Workshops. Using Bubbl.us, I created a mind map representing my online study connections. I chose online study with USQ as a main branch to develop a mind map because it is my focus and goal at the moment. The mind map demonstrates a link between my study with USQ, family, friends, and ITC connections at home. This week I have learnt about the RAT model (Hughes, Thomas & Scharber, 2006) using ICT in teaching, learning and curricular practices. RAT is short for Replacement, Amplification and Transformation. When technology serves as a digital means to same instructional practices, the Replacement happens. Also, technology increases efficiency, effectiveness and productivity of same instructional practices, then plays as Amplification. Technology provides Transformation because it invents new instruction, learning, or curricula. When teachers apply ICT in teaching and learning in educational practice, they embed ICT into three dimensions (dimensions of instruction, dimensions of students’ learning processes, and dimensions of curriculum goals) (Hugles, n.d) . This model helps teachers, and pre-service teachers see how technology used connects to the subject matter content. This course has helped me know about the RAT model which was previous unknown to me. The explanation of the meaning of each letter in RAT model as well as applying it when teaching a subject helped me gain a better understanding of its use and application of ICTs when planning learning experiences. 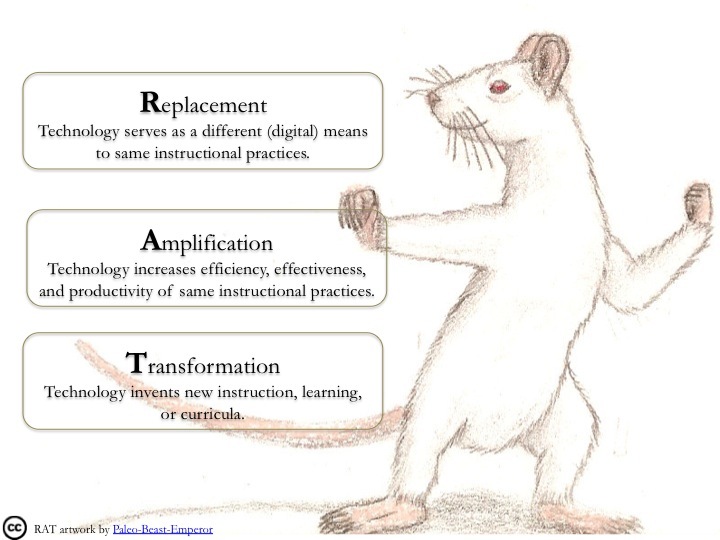 When planning the learning activities, I asked myself questions such as how do I use ICTs to implement Replacement, Amplification or Transformation of the RAT model to support students learn effectively, and what do I need to change ? Hughes, J., Thomas, R., & Scharber, C. (2006). Assessing Technology Integration: The RAT – Replacement, Amplification, and Transformation – Framework. Paper presented at the Society for Information Technology & Teacher Education International Conference 2006, Orlando, Florida, USA. https://www.learntechlib.org/p/22293. Hughes, J (n.d). R.A.T. Model. Retrieved from http://techedges.org/r-a-t-model/. to provide students with opportunities to achieve learning outcomes through the learning experience provided. I would organize learning activities which help students learn with ICTs to transform the knowledge they learnt. Investigation The teacher has developed an interest in using ICT with students and is beginning to act on this interest. Integration The use of ICT becomes critical to the support of the learning environment and the opportunity for students to achieve learning outcomes through the learning experiences provided. Dann, C. (2017). EDC3100- Week 1: First tutorial – PowerPoint presentation. University of Southern Queensland. Retrieved from https://usqstudydesk.usq.edu.au/m2/course/view.php?id=10924.